This is sort of an Andis clippers product review, but also sort of a brag. Forewarning! Purchased from SmartPak. Price is $161.45 if you get the 5% USEF discount. I paid $136.45 because SP had emailed me a $25 gift card for shipping something late in January- talk about customer service! 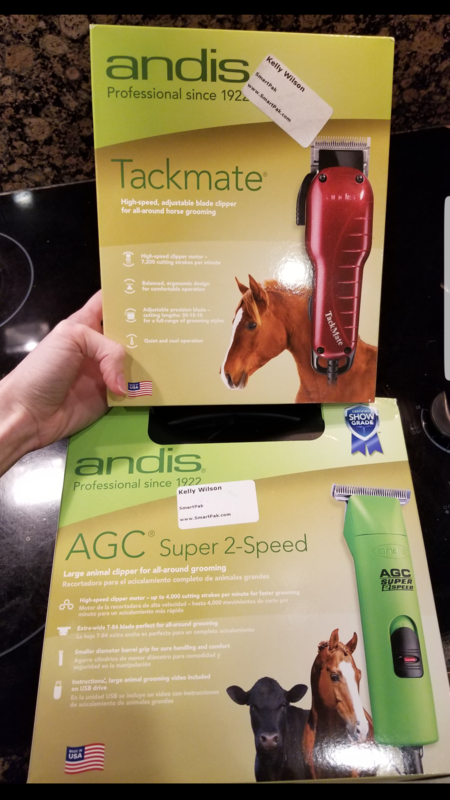 They also have a promotion where you get a free pair of Andis Tackmate Clippers when you buy the AGG Super 2-Speed pair. I think those sell for around $30, so not high end clippers by any standard, but still- FREE. I didn’t even realize they came with a separate pair of clippers for free, I was muy confused when I opened the box and found 2 pairs! I used these green beauties to body clip Rio. On Saturday I spent 3.5 hours on his body and face. Didn’t even think about getting to the legs. YES. I AM SLOW. I admit it. I am also pretty new to clipping, and a perfectionist. I clipped the legs 2 ays later in about 1.5 hours. Anyway- I love these clippers. So quite, and so powerful. Relatively light weight for body clippers (don’t even get me started on those giant Oster monsters), and easy to use, even with your non-dominant hand. I would highly recommend these clippers to any clipping newbies like myself. In my area, the going rate for a body clip is $150, so these clippers have already paid for themselves in one clip sesh. These Andis clippers came with the Andis T-84 blade (the really wide one), but you can buy them on Amazon for $25. 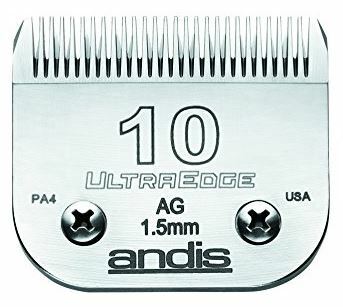 I also ordered a separate Andis 10 UltraEdge blade from Amazon for $19. I am not sure I’m in love with the T-84 blade. You would think that wider blade would be faster, but I honestly felt like I found myself going over the same area more with that blade because I couldn’t get it to cut as evenly. This is likely because I am not very practiced with it, but I think I my stick to the 10’s in the future. Plus, the 10’s are $6 bucks cheaper. Like any clippers, the blades do get hot. I found myself switching between the 2 sets of blades approximately every 20 minutes. I will say- Rio was dirty. I did not bathe him. It was kind of cold, and power was out at the barn (so no hot water heater). 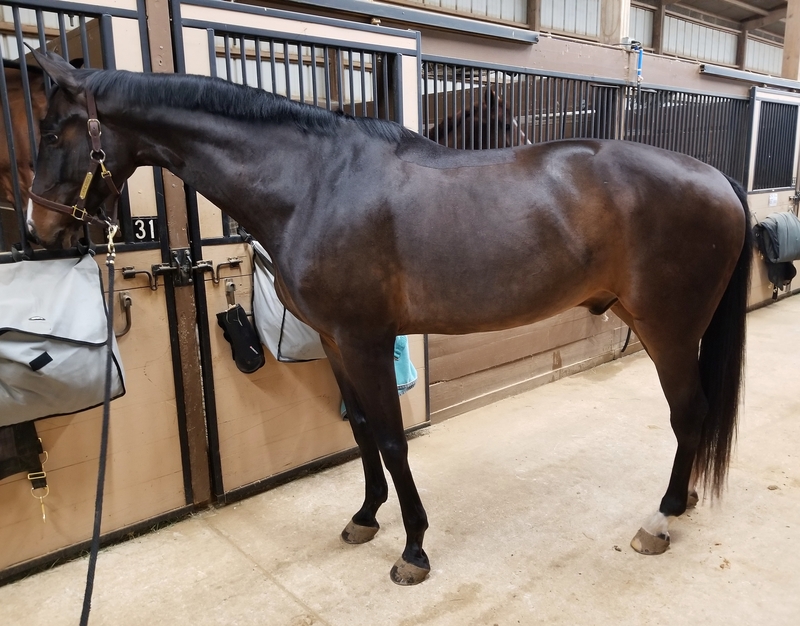 I clipped him in the lower barn where the polo ponies live (only place with electricity), so I couldn’t even vacuum him like I normally would. I was able to clip his entire body and legs with only 2 sets of blades on a relatively dirty horse (dirty for body clipping standards), so I think that’s pretty dang good, all things considered. Now the the good part! Photos!! Isn’t he the HUNKIEST?!?! And look at those clippers lines! What clippers lines, you may ask? That’s right, there isn’t any!! Big thank you to Andis clippers for making an user friendly and economical set of clippers! They are great “starter” clippers, or secondary clippers, or for someone who doesn’t body clip much. I started out with these and still have mine. I do my main clipping with Lister’s but use these for smaller or sensitive areas. They are a solid buy. I bought mine used like 6 years ago and they’re still ticking just fine. Glad to hear. I am definitely a “new” body clipper, and only plan to do 2-3 clips per year. Sounds like they will hold up well to that amount of use! Ditto Amanda on the Listers. No blade switching at all. I got Sterling fully body clipped in less than 2 hours (even with a minor war bc he’s a nut) with them. Horsey bestie is crazy and will do full body clips without washing her horses and gets and least 3-5 full clips on one set of blades. #crazy I don’t have the Andis, but that is a great size to do legs, ears, face and bridle path on a regular basis! Do you like the little freebies? 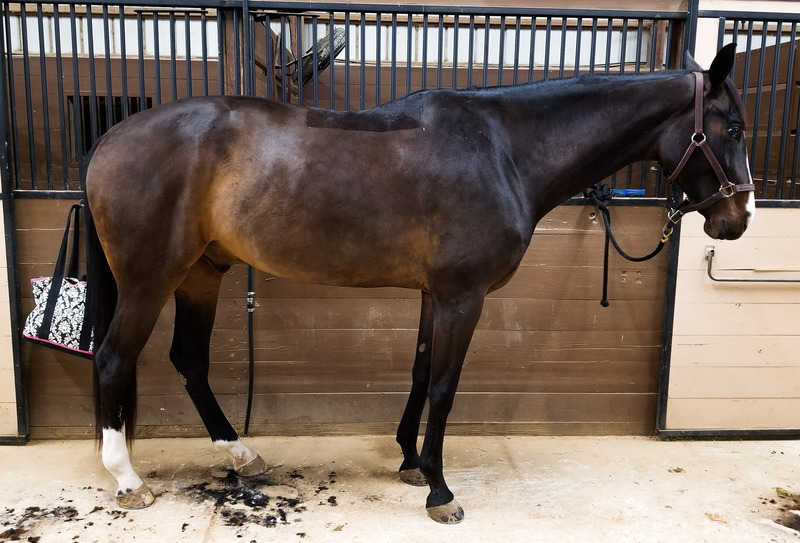 I want to buy a small cordless pair of clippers to have at horse shows for when I forget to clip something before I get there. I use these clippers as well! I think they’re great! I live in Idaho, so only clip in the winter, maybe 2x a year and I can get a blade to work for at least one full body clip on a clean horse. I’ve been really happy with mine! I love Andis clippers (I have the super 2 speed with easy detach blades — I had a different Andis that required screwing blades in and out which I did not keep because they were not easy to work with). I have had my good pair of Andis for three years now and use to shave my dog (32lb very long haired mutt). 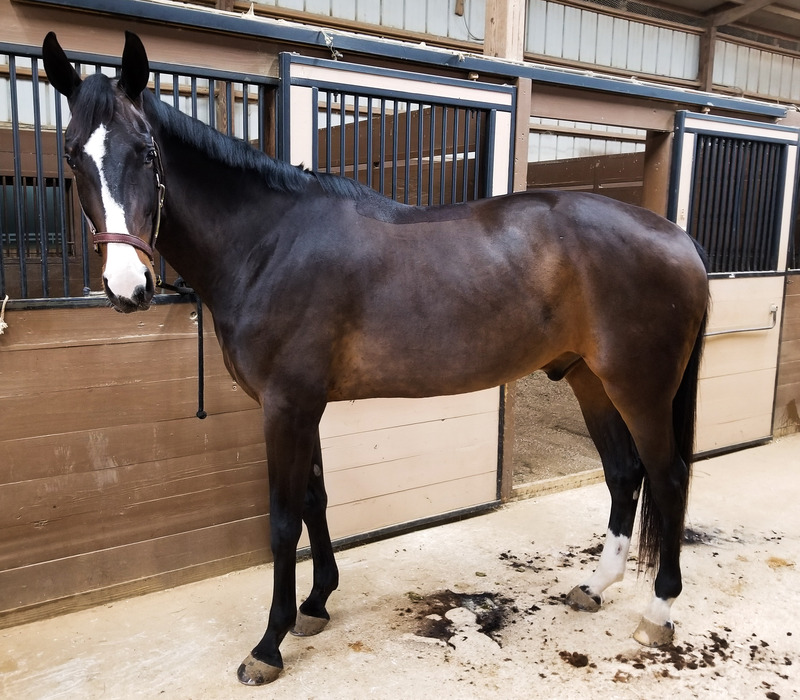 I have never ever clipped a horse before, but this year I decided to just do it because nobody else was going to – nor was I willing to pay a bunch of $ for it. I only did a bib clip, but for my first time I think it went really well. Absolutely no issues with clipper lines. My human drawn lines weren’t perfect, but that is on me and not on the clippers! This was the result, it will get better with practice: https://imgur.com/a/FXwuO . I bought the Andis 2 speed 2 years ago after paying $140 for a body clip! I’ve used mine to full body clip my mare, as well as multiple trace clips, so they pay for themselves quickly. Like you, I prefer the 10 blades and not the t-84. I’ve added a heavy duty set of body clippers to my tack box this year and cannot wait to put them to the test soon! Glad to hear I’m not crazy for preferring the 10s. What heavy duty pair did you get? I have these also (both pairs, love that it’s pretty much buy one, get one free!) and have been happy as well. I don’t clip much- bodyclip once or twice a year (with the exception of this year), and then pretty much just bridle path clipping throughout the year. But they’ve held up well the last several years so definitely a good buy! Glad to hear! I will be doing MAX 3 full clips a year, so I am planing on these folding up for many years! I am definitely NOT stalking your blog at work (LOL)….these clippers are THE best. I have used them for 10+ years now. I used them to professionally body clip, I’ve used them at an FEI barn, and I’ve used them on my own horses. I’ve only had them repaired/tuned-up one time. I, too, prefer #10 blades- BUT, if you like the width of the T-84, they do make T-10s, and I do like those. A) You are always welcome to stalk to my blog. B) So glad you love them too! I have actually had a lot of body clippers tell me these aren’t the best and don’t hold up, but I personally love them. I am only using them 3-4 times a year, but I am glad to hear yours lasted a long time. Did you get your blades sharpened or always buy new ones? I’ve heard it’s not really worth getting them sharpened. So far I’ve jut bought new ones, but I am getting quite the collection and thinking about sending a bunch out for sharpening.